In today’s rapidly changing communications environment, investor relations professionals face a wide range of issues to consider in providing maximum transparency and outreach with their company news and specifically, the critically important earnings news release. 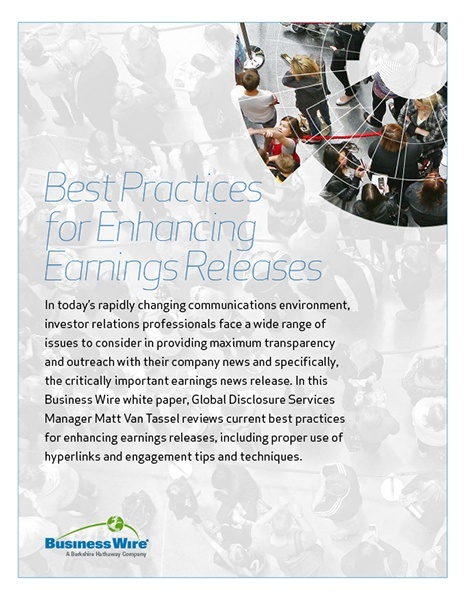 In this white paper we review current best practices for enhancing earnings releases, including proper use of hyperlinks and engagement tips and techniques. Download our free white paper and learn how to enhance your earnings releases and deliver information to your IR audiences in the most efficient way possible.